One of our two pressure mounted gate designs - the Emperor Rings dog gate is a simple mission style gate with stylish ornamental rings. 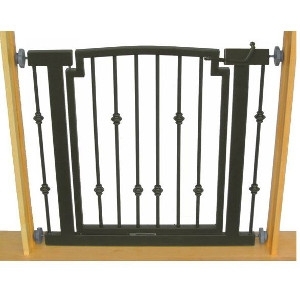 All of our gates are sturdy, easy to install and require no drilling. 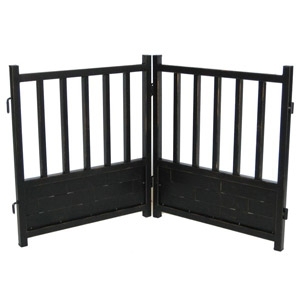 These highly versatile, freestanding gates are the perfect solution to small dog owners looking to block a wide range of openings. Sold in two panel sets, additional panels can be added indefinitely. "Expands from 29 to 34 inches. 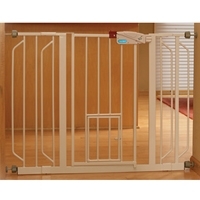 Add the included 4-inch and 6-inch extension and expand your gate to 44 inches to cover wide openings and stairways. Convenient walk-through design has an easy, one-touch release handle. Patented pet door is 10 inches by 7 inches to let small pets pass through, while everyone else stays put. Pressure mount system makes set-up quick and easy. All-steel construction is sturdy, durable, lead-free, non-toxic and chew-proof."